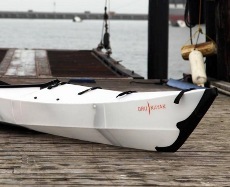 Oru Kayak is an innovative new kayak that unfolds out of a compact case. The Oru Kayak is lightweight, sleek, and fast. It is 12' long, weighs 25 pounds, and assembles in 5 minutes. The design is inspired by origami. To use it, just unfold it from the carrying case. Fold it back once you have finished kayaking. 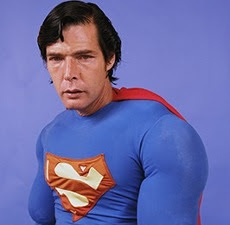 Impersonators is Nicolas Silberfaden's latest photographic project featuring unemployed superhero and celebrity impersonators that live in LA. He writes: "Making them pose in their costumes against a colorful backdrop, I ask them to manifest feelings of genuine sadness – honest emotions that are a consequence of our current times." 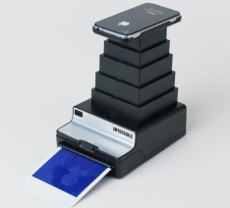 The Impossible Instant Lab is like a Polaroid for your iPhone. It transforms any digital image via your iPhone into an instant photo that is exposed using only the light from the display, then processed and developed by chemicals. Compatible with instant film for Polaroid 600 and SX 70 cameras. Sweet! 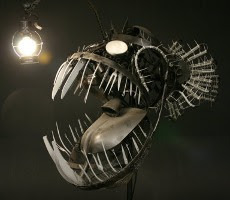 This Deep Sea Angler Fish is made with recycled objects such as parts of a bicycle, scoop shovel and knifes. Standing at 5 feet tall with base, 4 feet wide and 5 feet long, the fierce looking fish features an energy efficient, motion detecting lighting. The light over its head glows bright when you first look at the fish. Walk closer and the body lights up. 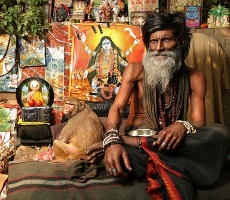 Kevin Goss-Ross from Dublin went to India with his family and snapped these amazing portraits. He writes: "Varanasi is an incredible place frozen stubbornly in the past. Despite my anger I have fallen in love with this magical city. If I do nothing else with my life, I will make it back here one day and probably never leave again." Follow the Force and the time, Star Wars style with this new set of Star Wars themed watches from Seiko. There are five different designs inspired by R2-D2, Darth Vader, Darth Maul, C-3PO, Yoda and Storm Trooper. 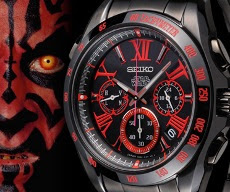 I like the Darth Maul watch. Red and black looks so good! Igor Sergeev has been collecting full unopened cigarette packs since 1976. There are 41269 packs in his collection now! I'm interested in his Singapore collection. 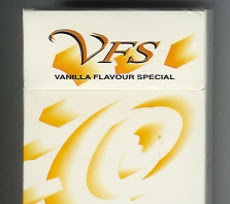 There are few cigarette brands that I've never seen before like this one called VFS (Vanilla Flavour Special). Take out your crayons or colour pencils and colour this 1983 X-Men colouring book which is part of The Uncanny X-Men Super Activity Book containing puzzles, games, word fun, mazes and more. 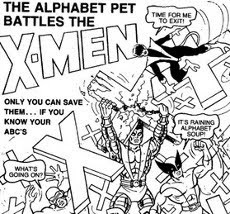 Only you can save the X-Men if you know your ABCs and it also helps if you know how to colour. Since young, Bruce Mahalski whose parents are scientists, has been collecting shells, fossils and bones. Now an artist, he uses bones of dead animals to make weapons such as this cool Bone Pistol set. The head on the bottom gun is from a ferret. 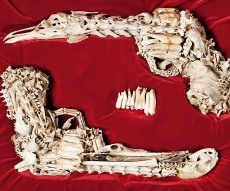 The top one from a black-backed gull and both have barrels made up of a cat’s vertebrae! 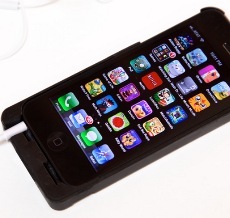 The iExpander expands the iPhone's memory, camera and battery life. It has an expandable SD memory, 2x battery life and lets you take great low light images and videos thanks to its powerful LED flash. The iExpander which also doubles as an iPhone protective case, is currently looking for backers on Kickstarter. 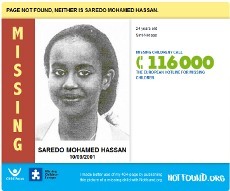 The NotFound project makes it possible to turn the ‘not found pages’ also known as the 404 error message pages of websites, into missing children messages. The choice of the shown missing persons message on the 404 page will be at random: it could be a recent disappearance or a child that has been missing for a long time. Dude built this Steampunk Nintendo for his nephew using an old NES-101 model of the Nintendo Entertainment System, known informally as the "top-loader" because of its top-loading cartridge slot. 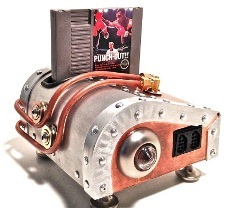 Items such as copper sheet, aluminum angle iron, sheet metal, rivets, etc were all used to give the NES a steampunk look. Bought the new Fifa 13 game? Go download an exclusive sleeve featuring your team's star players. 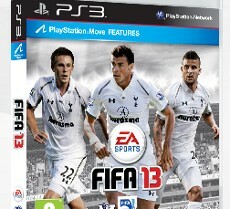 Print it and place it on the front of your Fifa 13 box. There are 8 club partner covers available: Arsenal, Aston Villa, Chelsea, Everton, Fulham, Manchester City, Newcastle United and Tottenham Hotspur. 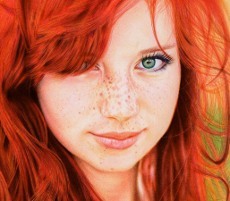 If you think this pic of a redhead girl is a photograph, then think again. It is actually a drawing done by VianaArts using nothing but colored Bic ballpoint pens! He took 30 hours to finish this incredible piece. For his animal and people portraits he uses a technique of cross hatching the different colors in layers to create the illusion of blending and the illusion of colors he doesn't have. 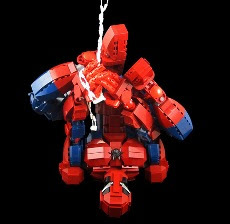 I've seen a lot of incredible Lego masterpieces but this ultra-poseable Lego Spider Man action figure by mmccooey is really mind blowing! He writes: "Spider-Man needed to be extremley posable even more so than a typical human being. He also needed to be slimmer to match Spider-Man's lithe, athletic physique, while including additional joints. Quite a challenge." Here's a neat Ikea hack. You can use a white Ikea kitchen door handle and a silver/chrome Ikea curtain rod holder to make a desk stand for your iPad! Dude writes: "It works in both portrait and landscape mode, and while it maintains a clean minimal look, it has got something of the modernist mid-20th century in it." 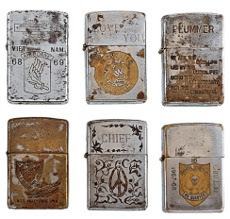 Cowan Auctions is auctioning a set of 282 Zippo lighters featuring personalized and anonymous engravings chosen by U.S. soldiers, sailors, and airmen during their Vietnam war deployment. Many messages on these zippo lighters are related directly to combat. Some feature the emblems of proud units. John Woo (not the HK film director) did a set of illustrations of Star Wars characters dressed up in clothes designed by prominent fashion designers. 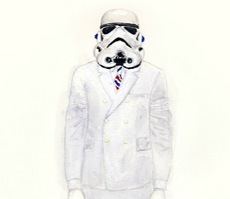 This pic here is a Stormtrooper wearing Thom Browne! All the prints are also available for sale over at John's Etsy site. 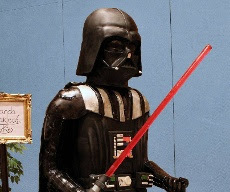 The extremely talented folks at Amanda Oakleaf Cakes were asked by the 501st Legion to create a cake for their 15th Anniversary Celebration so they decided to make an epic Darth Vader cake that stands 6 feet and 7 inches tall! The 500 lbs cake fed nearly 600 hungry Legion members. Awesome photos of some 300 zombies attacking St. Petersburg. 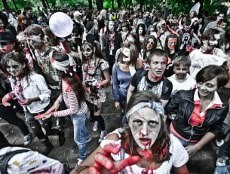 The organisers of the zombie walk/flash mob say it is the 4th such mob of its kind to be held in St. Petersburg. The rules state: "The living dead are responsible for their own actions; they don’t bite other people; they don’t damage other people’s property." Miss Insomnia Tulips says she's not very good at most things but she's definitely good at macarons! 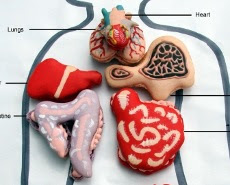 Her range of Anatomical Macarons include the human brain, heart, liver and even the male and female reproductive systems! And because they are a mixture of vanilla and raspberry macarons, they are all edible! Batman of Shanghai is a series of animated shorts from the DC Nation block on Cartoon Network, presenting a unique re-imagining of the Batman universe in a heavily stylized form, set in a 1930's era Shanghai. I love the character design and animation. Maybe Hollywood can take a look at the video above if they want some ideas for a Batman reboot. 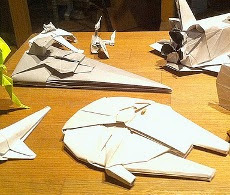 Shu Sugamata is an origami expert and over at his Flickr, you can take a look at his incredible Origami Spaceships which he has been making since 1977. Lots of Star Wars spaceships including the X-Wing, Star Destroyer and the Millenium Falcon! He also posted some of his origami diagrams. 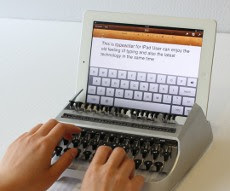 Product and industrial designer Austin Yang's iTypewriter lets you enjoy using a typewriter to type out words on the iPad. 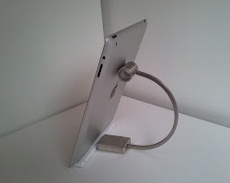 He writes: "This product provides an easier way to type on the iPad. User can experience the physical strength transfer from the keypad and the movement of each key." Brilliant idea! 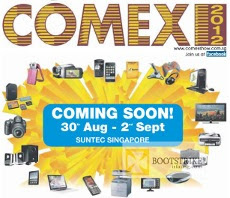 Singapore's biggest IT and consumer technology exhibition, Comex 2012 is now on at Suntec. You can check out the Comex 2012 price lists, flyers and brochures by 124 exhibitors such as Sony, Canon and Harvey Norman. I see a few good deals there but will pass. Hate the crowd.